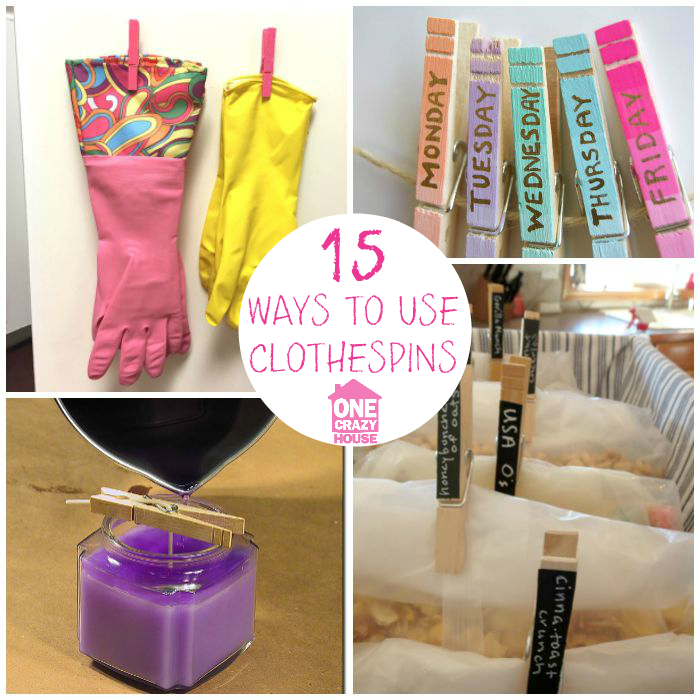 If you have a dryer, you probably don’t have many clothespins lying around the house, but you should! 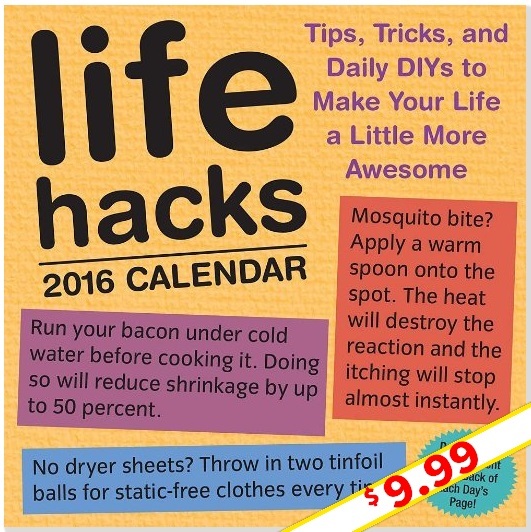 These little contraptions can be used for much more than hanging your clothes out to dry. We have a great organization tip below for many different needs like keeping foods fresh and simply making your life a little easier. 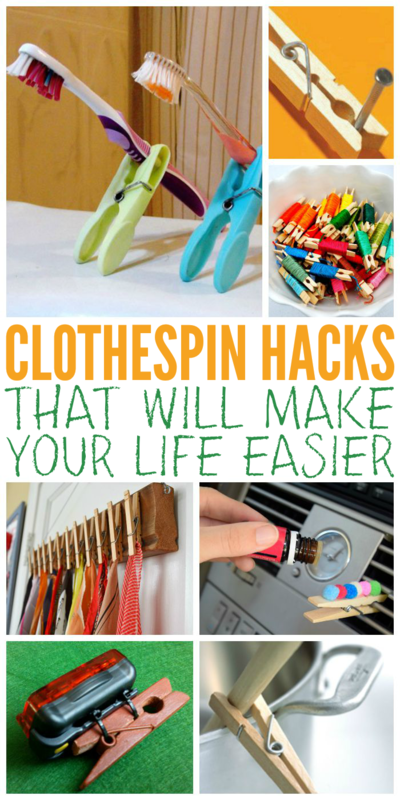 Check out these clothespin hacks for more clever ideas. Make a handy dandy toothbrush holder wherever you are. This is an awesome organization tip! Isn’t this scarf display lovely? You can easily make one yourself by gluing clothespins to a pretty board and hanging on your wall or door. Keep your headphones untangled and tidy with one of these diy headphone clips. Cute! We love a good organization tip for daily tasks, and this one is so cool – hang your to-do lists on pretty painted clothespins! Put a few drops of your favorite essential oils on pom poms and glue them to a clothespin for a frugal air freshener for your car. Use mini clothespins when sewing binding or piping to avoid moving around a bunch of needles. Organize your emroidery floss easily with a bunch of clothespins. No more tangled messes! If you make your own candles, use a clothespin to keep the wick upright while you’re pouring the wax. Create your own clip-on light for your bike using a cheap light from the Dollar Store, some zip ties and a clothespin. Keep your wooden spoons from sliding into the pot with a clothespin spoon rest. This is a really great organization tip for potlucks, reunions, etc., where you have loads of people serving themselves. Roll and pin the tops of cereal and chip bags to keep them fresh. Stick clothespins to the inside of your kitchen and bathroom cabinets to hold your cleaning gloves. Hold parchment paper in place when baking with clothespins on each side. Great idea for wax paper, too! Are you clumsy with a hammer? Never hit your fingers again with this cool clothespin trick to hold nails in place. Traditional Wood Clothespins– the original-style clothespin, this simple design has lasted through the ages for a reason. 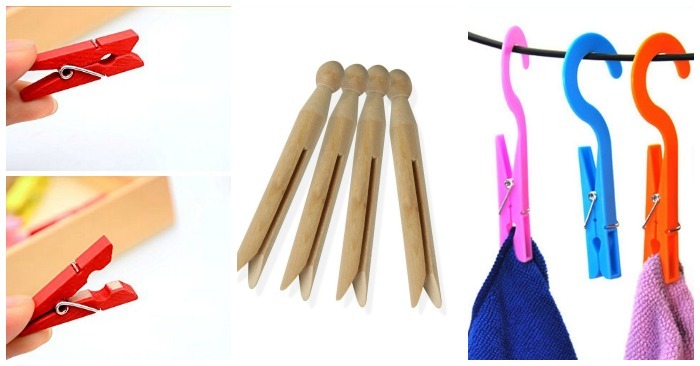 Mini Colorful Natural Wooden Clothespins are perfect for crafts and other creative projects. These laundry hooks are a life saver!